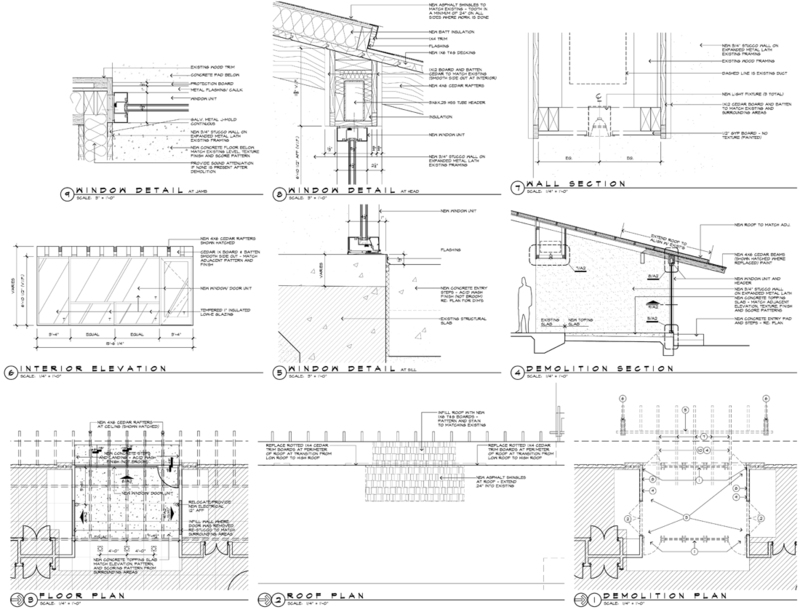 As an architect I am here to tell you that designing and preparing drawings for work on your own house is a drag. This isn’t news to most architects and it’s a topic that I have covered here on Life of an Architect before. The difference between then and now is that I am finally going to be doing a small renovation to my home and I had to spend my evenings and all weekend preparing drawings for permit and for the contractor. This is the room that we are going to renovate … we currently call it the playroom but there’s no playing that goes on here. We should really call it the “this is where all the miscellaneous stuff we don’t know where to put goes” room. You can probably guess that my daughter LOVED this room as it was because it was mostly her stuff. My wife and I decided that we wanted to add a dining room/ sitting room off the Den and open up the wall so we could get more light into the interior of the house – which was #1 on my list of things that needed to get changed. So this is the kickoff post for this project … and it starts with my complaining about how terrible it is to be your own client and have to prepare your own drawings. That’s not true but I do tend to approach things like this with a “big picture” mentality – you know … I can’t change this without changing that. So in order to get started, I had to start with some exploratory demolition to know what I had to work with and what I could change. The picture above is a furr-down between the playroom and the Den. The white thing at the top of the picture is the main duct that runs the entire length of my house. It’s not going anywhere and I have no choice but to work around it. This picture is a closeup view of the exterior wall where the new window unit will be going. The playroom was originally an exterior patio but at some point it was enclosed and turned into a bonus room. As a result, the floor is about 3″ lower than the surrounding interior rooms and the floor is completely made up with dry fit brick pavers. I removed the cedar board and battens on the interior side of the exterior wall so I could take a look at the rafters (you can see the nails that were left behind in the removal process). If you look at the dark wood rafter in the middle of the picture, you can see where the rafter was cut and replaced as it passes through the wall due to rot on the exterior portion of the beam. It rotted out before and was replace and it’s rotted out again and now I have to replace them – lucky me. Yes, once the wall was opened up, I couldn’t help but pull out the shop van and remove cobwebs, dust and other things that have been in there since 1967. The boards I pulled off are leaning up against the glass. I know I am probably belaboring the point but this picture gives you an idea of just how exposed and interconnected everything is in this room. There also isn’t any gypsum board in this room – really in the whole house. That makes “patching” things difficult because if it’s here, it’s serving a dual purpose – structural AND aesthetic. This is a picture taken from the playroom looking back at is the wall separating this space from the Den. This wall was originally the exterior wall of the house. Recognize the Lamps of Lost Souls? Exterior door frame, true masonry stucco, concrete grade beam, and brick pavers …. Part of what is making the process of documenting existing conditions a little easier is that I have the original architectural drawings for my house. THings were built a little differently back in the 60’s and these drawings give me a good idea of what was done and how it was built (without having to rip everything open). So here is part of how I spent my weekend – preparing a full set of drawings so that I can use to pull a permit on my project. This is just one of the sheets I had to prepare to explain what has to happen. There are loads of demo drawings with specific instructions on what needs to be removed, how and where (again … because it IS like surgery). What kept going through my head all weekend as I sat in front of my computer was how much preparing the process of preparing these drawings was draining my life force – why is that? I do drawings like this all the time and I generally like doing it but for some reason, having to do it for yourself is terrible. Someone suggested that part of the reason it’s so bad is because this is what I do for a living and in this regard I’m not getting paid. I’m not sure that I can agree with that because the flip side is that I’m also not having to pay someone with my skill level to do it for me. This is a little project – I wouldn’t say it’s simple but the scope is pretty simple to define. What do the people who can’t prepare their own drawings do? Who helps those people? If I paid myself to do this hourly it would have cost me approximately $3,500 (assuming I wouldn’t give myself a break on the fee) to create electronic as-builts and then prepare the documents suitable for pulling a permit. At any rate, I got them completed and dropped off at the contractors house (talk about service!) so he can get them in for permitting. I will keep you updated on my progress which also includes re-finishing all the concrete floors in my house. And I need to have it all completed by Thanksgiving.